- executes the automatic tare and the enabling of the automation through its dedicated outputs: the dosages start at maximum speed. 2. Once the speed switch threshold is reached, the dosage slows down through its dedicated output. 3. When the TARGET is reached and the configured flight weight is missing, it disables the dosage output, and then it waits (for the configured time) for dropping the material. 4. Tolerance test on the dosed weight. 5. Storage of the formula consumptions and increment of the dosed general total. 6. Waits for the start of the new dosage or automatically restarts with the following cycle. 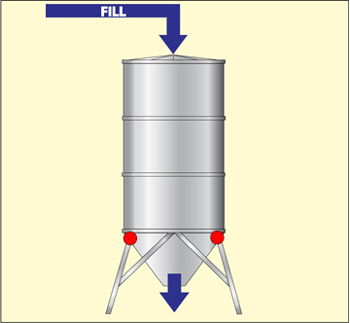 Configuration which allows to manage a dosage system in unloading of a single product, useful for dividing the quantity of materials of equal weight or extract precise quantities from the silo, with management of the reloading. Database of 40 formulas with target, speed change threshold, flight, +/- tolerance. START / RESTART dosage, PAUSE / RESET cycle and introduction / selection formula. Quick switch of the dosage target, through a dedicated key. Serial communication protocol for programming the formulas, the products and managing the cycle. START / RESTART dosage, PAUSE / RESET cycle through external inputs. Formula selection through 2 external inputs (only for models with 4 inputs). Dual dosage speed (approximate and fine), through any available contacts or analogue output (in the “AN” models). “Fine” dosage contact active either constantly or intermittently (jogging). Automatic management of the reloading of the silo using a dedicated contact. Indication of weight within tolerance, out of tolerance, finished dosage, or alarm through any dedicated contacts. Analogue output (only for "AN" models) proportional to the weight or to the dosage speed. Automatic printing of the dosage data. Storage and printing of the consumptions. Printouts may be quickly recalled from the keyboard. Automatic correction of the flight weight. Repetitions of the programmable dosage cycles; infinite cycle function. Tolerance test on the dosed weight, with guided correction on display. 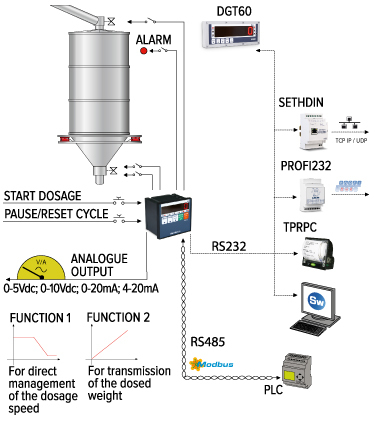 Control of the maximum dosage time. DGTQF Microcontroller for dosage, with 2 IN and 6 OUT. 5-key keypad and LED display. DGTQFAN Microcontroller for dosage, with 2 IN, 6 OUT, analogue output. 5-key keypad and LED display. DGTPF Microcontroller for dosage with 4 IN and 6 OUT. 5-key keypad and LED display. DGTPFAN Microcontroller for dosage with 4 IN, 6 OUT and analogue output. 5-key keypad and LED display. DGTPKFV2 Indicator for dosage, with 4 IN and 6 OUT. Stainless steel case for table or panel mounting, 20-key keypad and LED display. DGTPKFANV2 Indicator for dosage, with 4 IN, 6 OUT, analog output. Stainless steel case for table or panel mounting, 20-key keypad, LED display, and standard weighing program. DFWATEX2GDF ATEX 2GD indicator for single and multi product dosage. IP68 stainless stell case, 17-key keypad and LCD display. Protection mode: ATEX II 2(2)G Ex ib [ib Gb] IIC T4 Gb for gases and ATEX II 2(2)D Ex tb [ib Db] IIIC T197°C IP65 Db for dust. To be combined always with the PW200XRDxxx series' power adapter and PW200IO option. Complete with manuals and ATEX EU CONFORMITY DECLARATIONS, available in DE, EN, FR, and IT.